In the hills above St. Tropêz lies the beautiful flower village Ramatuelle. The picturesque centre is built on a hilltop and is surrounded by colourful houses, small streets and alleys. The village is famous for its location near the beach of Pampelonne and is part of the Côte d’Azur. As the name implies the water is clear and blue, and is matched with fine, warm sand. It’s the home of luxurious beach club’s and beautiful people. 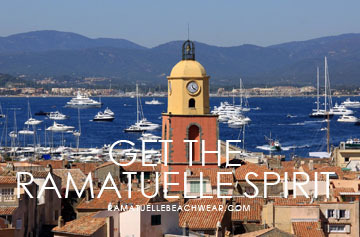 It was at this beach where Gitty first envisioned her future brand Ramatuelle. "The greatest summer starts with the coolest swim shorts" Our goal at Ramatuelle Beachwear is to deliver the perfect swim shorts for the fashion conscious modern man. 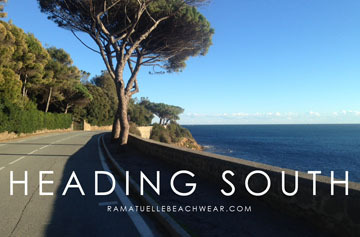 We will make sure that you're ready for the summer and that you look cool in your Ramatuelle swim shorts. 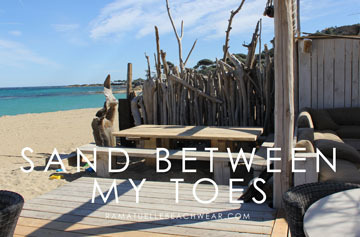 Recently we have added a complete boy's swimwear collection to our Ramatuelle beachwear line. Our products are inspired by the Riviera lifestyle. Just as the Cote d'Azur, our swim shorts are luxurious and they provide the ultimate summer feeling. As designers we continuously observe our surroundings to find things we can use in our Beachwear designs. We find beautiful color combinations in nature like the colors in a sunset, landscapes and life under the sea. We combine small pieces of inspiration that we found, we find the essence of the things we like and use it to create our own unique designs. The designer Charles Eames once said "Details, ultimately it's the details that give the product to life." We stand behind this idea for Ramatuelle and pay close attention to the details of our swim shorts. Our beach shorts are made of high quality fabrics, with several special features. Through weaving or digital printing patterns and decorations are extremely sharp and detailed. The Ramatuelle swim shorts also have colorful piping, beautiful stitching and embroidery. Besides the decorative and qualitative details we have also very functional details added to our swimming shorts. Examples of the details are a loop for your keys so you do not lose while swimming this, pockets, a back pocket that closes with Velcro, a water-repellent coating that ensures that your swimsuit dries quickly and a handy pocket for your credit card to the inside of the waistband. Read the product description which of these details have been added.